Valentine’s Day is just three days away and have I got the perfect dessert for you to whip up for that special day. The dreamiest strawberry cheesecake you will ever put in your mouth. This strawberry cheesecake is not only a pretty presentation it is truly the best cheesecake I have ever eaten. A lot of cheesecakes that I have tried in the past have a sort of dry like texture to them. Not so with this one. It is so wonderfully creamy and the perfect amount of sweetness that makes it not so rich you have to stop after a couple of bites. In fact, you could eat the whole thing, but okay, we will not do that. It is the perfect, delicious, creaminess from the first bite to the last. When creating the crust for this cheesecake I was inspired by another dessert I make from time to time which is called “strawberry pretzel salad”. It has a layer of crushed pretzels for the crust, then cream cheese and strawberry jello on top. I love the saltiness of the pretzels combined with the sweet……so perfect, but then again I am the type of person who sprinkles M & M’s on my popcorn when at the movie theater. That’s just me. So, I decided to do the same thing with this cheesecake and create a pretzel crust rather than a cookie crust. Oh my goodness, I am in Heaven!!! My son actually requested that I make this for him. It is his fave! So now I get to share the sweet, creamy, wonderfulness with all of you guys. I hope you will fall in love with this recipe like we have. ENJOY!!!! Combine pretzels, sugar and butter. Press onto the bottom of a 9-inch springform pan. Refrigerate for 30 minutes. In a blender or food processor, combine strawberries and cornstarch; cover and process until smooth. Pour into a saucepan; bring to a boil. Boil and stir for 2 minutes. Set aside 1/3 cup stawberry sauce; cool. Cover and refrigerate remaining sauce for serving. In a mixing bowl, beat cream chesse until light and fluffy. Gradually beat in milk. Add lemon juice: mix well. Add eggs, beat on low just until combined. Pour the mixture over the crust. Drop the strawberry mixture by teaspoonfuls on top. Use a knife or a toothpick to cut through the top to swirl the strawberry sauce. Bake @ 300F (do not preheat oven) for 45-50 minutes. Cool on a wire rack for 10 minutes. Carfully run a knife around the edge of pan to loosen; cool 1 hour longer. Refrigerate overnight. Remove sides of pan. Thin chilled strawberry sauce with water if desired; serve with cheesecake. Store in refrigerator. This recipe was adapted from www.allrecipes.com . This looks amazing, a stunning treat! Just drag a toothpick through the middle of the little strawberry dollops and it just naturally looks like hearts….easy peasy. That’s beautiful and it’s a baked cheescake! My Dad’s favorite. Is it a deep when you bake it? Well thank you! You make so many wonderful recipes yourself! What a beautiful dessert for Valentine’s day! You go girl! Wow, this is the perfect “Valentine’s day” treat! Thanks you. It is really so delicious! The pretzels are a fabulous idea! I will have to try this one, make it a surprise for my Jason! I’ll let you know how it turns out. I think I will have to give some away to friends though. I don’t want us to eat the whole thing! Or maybe I can freeze slices?! I know you can buy frozen cheesecake. Yes, my co-workers love for me to bring in the stuff I cook and it keeps us from eating it all! I haven’t tried freezing it but I would think it would be okay to do that. wow. 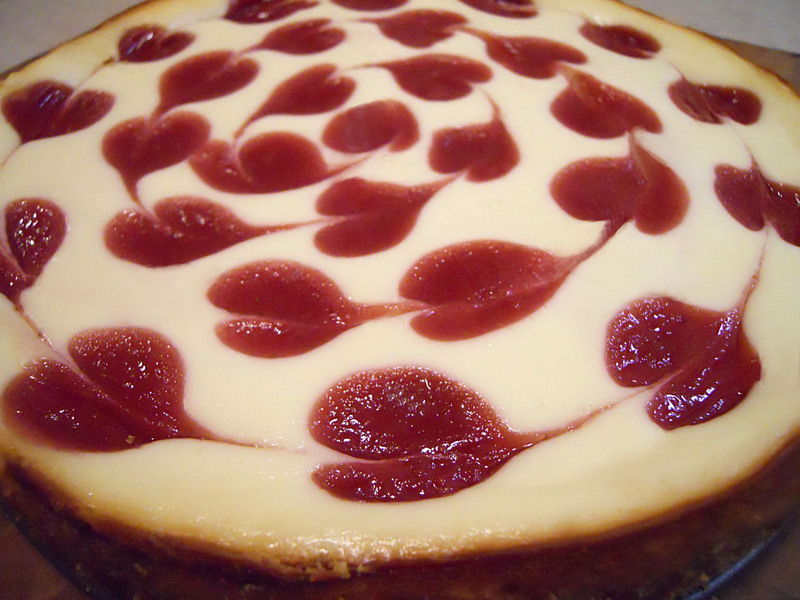 this cheesecake looks PERFECT! those swirled hearts are SUCH a cute touch. It really is a good one, it has never failed me. Well I made it and it is wonderful! I only had an 8 inch springform but it worked just fine. Also I think I must have used much larger dollops of the strawberry cause I only got about 6 hearts and I made one big on in the middle. I wish I could post a picture here. Maybe I’ll just put it on my blog and link it to you for the recipe. I’ll let you know when I do that. Thanks so much! I also just got my grandma’s cheesecake recipe from my mom so I’m going to have to try that soon and compare to this one, cause this one is pretty damn good! We finished it up pretty quick! Thanks. Thank you so much! It is a terrific little cheesecake.